Ballantine’s, the No. 2 Scotch whisky in the world, takes an innovative move into the Single Malts category, with the launch of three new Single Malts. 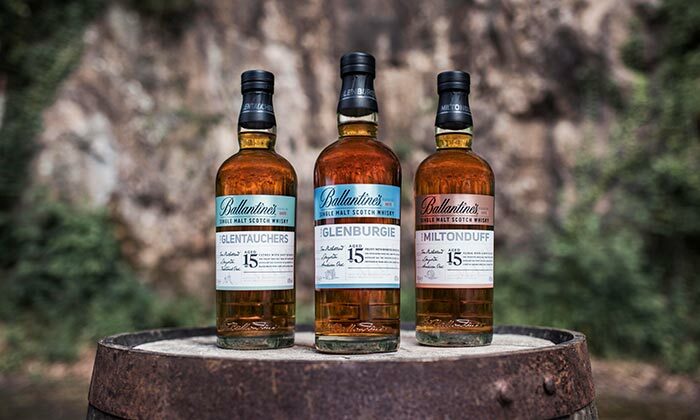 Peter Moore, Ballantine’s Global Brand Director comments: “The Single Malts category is dynamic and continues to grow rapidly as more consumers become lovers of this iconic Scottish spirit. As consumers taste the individual flavour profiles of Glenburgie, Miltonduff and Glentauchers, they will discover over 190 years of heritage and tradition born in the historic Speyside region of Scotland. Taiwan, the 4th largest whisky market by value and the most vibrant Single Malt market in the world, is the first country to officially launch the Ballantine’s Single Malts Series. From 23 September to 1 October, consumers in Taiwan will be able to learn about its ‘stay true’ heritage and innovative spirit through an interactive experience in the heart of Taipei. Through this experience they will be among the first to taste the three unique flavours of the Ballantine’s Single Malts. The Ballantine’s Single Malt Series is bottled at 40% ABV and available to purchase in the domestic markets at an RRP of $56 USD in Travel Retail Asia for 70cl bottle ($80 USD litre equivalent). The release of the series is a testament to the spirit of George Ballantine and the remarkable people, places and events that have been part of the brand since 1827. Nose: Perfectly balanced with aromas of sweet soft red apples and blackcurrant. Allied with this is wonderful honeycomb candy sweetness. Taste: Full and creamy with a velvety smooth texture (honey). This whisky is bursting with fruity sweet orange flavours. Finish: Very long, sweet and round. Nose: Rich fruity and sweet. Flavours of peaches in syrup, juicy sweet orange and creamy soft toffee with a hint of toasted almonds. Taste: Sweet scented floral flavours. Extremely smooth with milk chocolate flavours and hints of cinnamon spice, cloves and liquorice root in the background. Finish: Very long, warm and sweet. Nose: Bursting with sweet citrus fruit flavours (tangerine and sweet clementine) with hazelnut notes and a hint of delicate floral heather coming through the background. Taste: Coats the mouth with smooth, soft berry flavours of raspberry and blackcurrant, combined with a tantalising taster of barley sugar sweets. Finish: Incredibly long and luscious.